Norwood havent played well yet this season apart from patches and still havent got a decent scoring plan. Sturt played well against the Eagles and I expect Sturt to win Friday night against the Legs. Norwood could unveil another RAA Rookie in successive weeks for the blockbuster against Sturt on Friday night. Medium-sized defender Brodie Carroll (19, 186cm and 77kg) has been listed as one of five players on the extended interchange bench. The Tea Tree Gully FC junior has been joined by premiership utility Ed Smart and defender Mac Bower on the list of inclusions to the 23-man squad. Key forward Luke Surman is unavailable after suffering a foot and hamstring injury against Central in Round 2. Jack Oatey Medallist Matt Panos and ball magnet Lewis Johnston will play their 100th Statewide Super League matches. 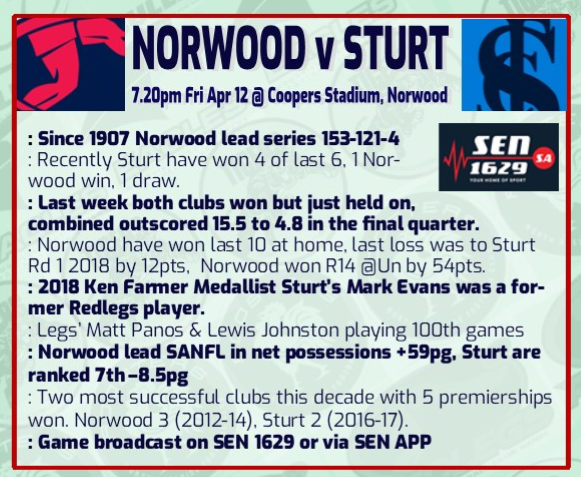 A forgotten premiership defender has earned a recall for Sturt’s clash with Norwood on Friday night. Henry Carey, a member of the Double Blues’ 2016 premiership side, has been named in the back pocket as the replacement for injured Guy Page. Page, who fractured his fibula in the first term against the Eagles last round, is expected to miss eight weeks after playing his first 124 games in succession since making his debut in Round 1 2013. Carey last played a Statewide Super League game in Round 8 last year while bigman Henry Voigt has been named in the ruck to play for the first time at League level since Round 18 2017. They have been joined in the 23-man squad by potential RAA Rookie Adam Trenorden (19, 177cm and 70kg) and small forwards Jack Penfold and Josh Dodd.